There are more than 70 miles of paved trails in Montgomery County. The Miami Valley also boasts the Nation Largest Paved Trail Network with more than 340 miles of paved, multi-use bikeways. Our network of greenways can get you where you need to go for business and pleasure. 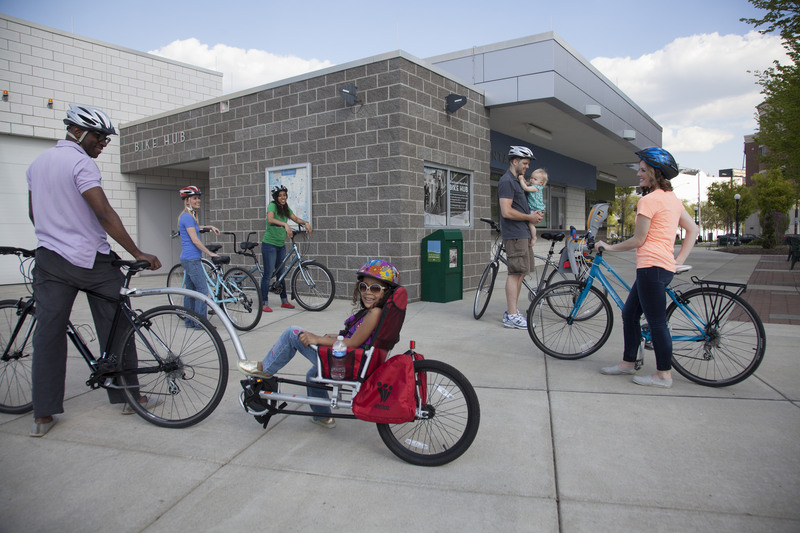 This extensive trail system along with new bike lanes downtown, the bike hub at RiverScape MetroPark and Dayton's bronze award as a Bicycle Friendly Community show why the Dayton region is a destination for cycling enthusiasts. Eastwood MetroPark’s lakes and the nearby Mad River make this park a great place to spot waterfowl, beavers, or even Eastwood’s famous resident bald eagles. Ride the Mad River Trail west to visit RiverScape MetroPark, home to summer festivals and concerts. The National Museum of the United States Air Force is a short ride east. The Mad River Trail is relatively flat, making it a great trail for families or beginner cyclists. The Great Miami River Trail bisects Taylorsville MetroPark from north to south. Travel to the north end and discover where the village of Tadmor once stood. Go south from the dam and stand on an observation deck far above a tall grass prairie. Along the way, look for remnants of the Miami-Erie Canal. Lush in the spring and summer, and ablaze with color in the fall, the Stillwater River Trail provides cyclists serene and diverse terrain. Ride south to visit Triangle Park and DeWeese Parkway, home to the Boonshoft Museum of Discovery. Ride even further south to reach the picnic shelters, spray grounds, and playgrounds at Island MetroPark. Ride north to Sinclair Park, just west of Shoup Mill Road. Return to Wegerzyn for a relaxing stroll through one of the gardens. From the north side of Wesleyan MetroPark, look for great blue herons and green herons foraging in Wolf Creek, or keep an eye out for signs of beaver activity on your way to the Wolf Creek Trail. Popular scenic viewing spots include the pedestrian bridge over Wolf Creek and the paved trail beneath the railroad crossing. Head east on the Wolf Creek Trail and wind your way through historic west Dayton toward downtown. The Great Miami River Trail passes through Island MetroPark where you can enjoy beautiful landscaped beds, myriad picnic shelters, and fishing opportunities, plus a children’s spray ground and playground. Across the suspension bridge, you’ll find the intersection of the Great Miami River and Stillwater River Trails. Visit Wegerzyn Gardens MetroPark by riding straight through Triangle Park and along DeWeese Parkway, home to the Boonshoft Museum of Discovery. Or, take a right at the intersection to follow the Great Miami River Trail through north Dayton toward Taylorsville MetroPark. The northern segment of the Stillwater River Trail connects Grossnickle Park to Englewood MetroPark. It passes through the relief spillway of the Miami Conservancy District’s earthen dam, along the base of the dam, and winds its way through Englewood MetroPark, where visitors can enjoy hiking, picnicking, fishing and even an 18-hole disc golf course. The Great-Little Trail, which traverses the Medlar Conservation Area, leads riders through wetlands, ravines, and mature forest to a hilltop vista. Ride west to the Great Miami River Trail south of Miamisburg. The trail makes a significant step toward a southern connection between the Great Miami River and the Little Miami River trails, the region’s two main arterial trails. A short ride on Lower Valley Pike will get you to Huffman Dam, the beginning of the Wright Brothers-Huffman Prairie Trail. Once you reach the other side of the dam, head down the switchback on the Mad River Trail, or head east on the Wright Brothers-Huffman Prairie Trail to the Wright Brothers Memorial – home of the Huffman Prairie Flying Field Interpretive Center. Continue riding east to Wright State University. Six bikeways pass through Montgomery County and all of them are partially or completely managed by MetroParks. Outside of Montgomery County, the Miami Valley Bikeway system continues with a variety of other trails. View the interactive Miami Valley Trails map. You know the expression, “It’s like riding a bike.” If you’re taking up biking again, or for the first time, follow these tips to Get Out & Ride! If it’s been a while, don’t worry too much about distance. Start with short, 10-20 minute rides. Any bike is a good bike if it is properly maintained. Keep your bike clean, well-lubricated, and make sure the tires have the correct air pressure. Local bike shops can get your bike running like new again, and provide you with valuable biking information. Not sure where to ride? Check out the Bike for Health Challenge rides that take place weekly from May through September on different sections of the paved trails. Bike for the Health of It!